Use this learning target tracker to help your students monitor their progress and document their level of understanding! Students place an X under a 1, 2, 3, or 4 to indicate where they are in their learning. A 1 is needs more help and a 4 is full understanding/can teach to others. 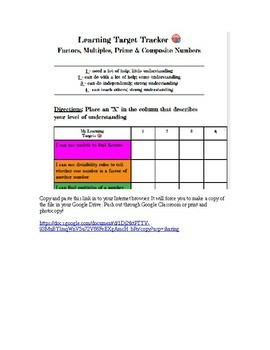 Learning Targets included are related to factors, multiples, prime, and composite numbers related to 4th GRADE MATH CONCEPTS. Once you download the file, you copy and paste the link in to your Internet browser. It will force you to make a copy into your Google Drive. You can edit the file if needed. Push out through Google Classroom or print and photocopy to have individual paper copies for each student. Please check out my store for other 4th grade Learning Target trackers!